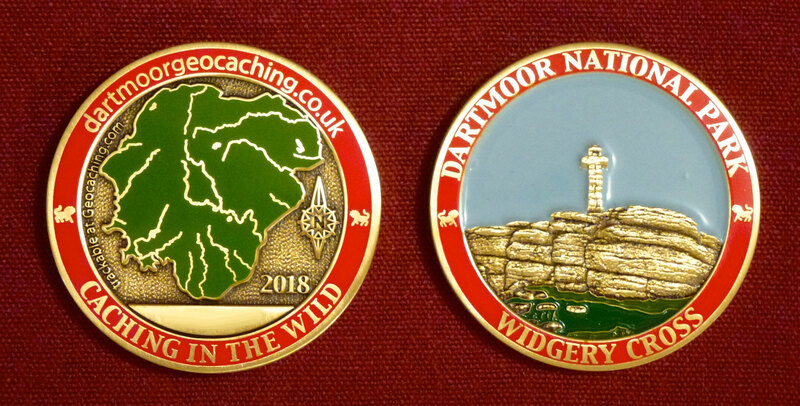 I have finally received the 2019 Limited Edition Dartmoor Geocoins and will be very pleased to take your orders. As you are aware, I was a little uncertain as to whether to produce a coin for 2019, but the poll I created was very well supported and I placed the order at that time. Please note that these geocoins are the bronze colour and not the silver colour – they are always so difficult to photograph! Also as promised, I will not be checking to see what you asked for, but I would ask generally that you all order at least what you did ask for. I would certainly welcome more for the geocoin race, for which I will soon be sending out the details. The cost for 1st class p&p will be £2 for 1 or 2 coins and £3 for 3 or 4 coins. 3 or 4 coins will be sent 1st class signed for. These postage costs have not changed for 3 years despite increases by Royal Mail. As a very special offer, I am offering 2016, 2017 and 2018 geocoins all at £10 each, if you buy at least one 2019 geocoin! This is to improve my cash flow, as I indicated earlier I am currently £800 down on last year. There is now only a handful of 2014 coins left and these will be £18 each, there is also a dwindling stock of 2015 coins and these are available at £16. However, for multiple purchases I will be pleased to offer a discount. 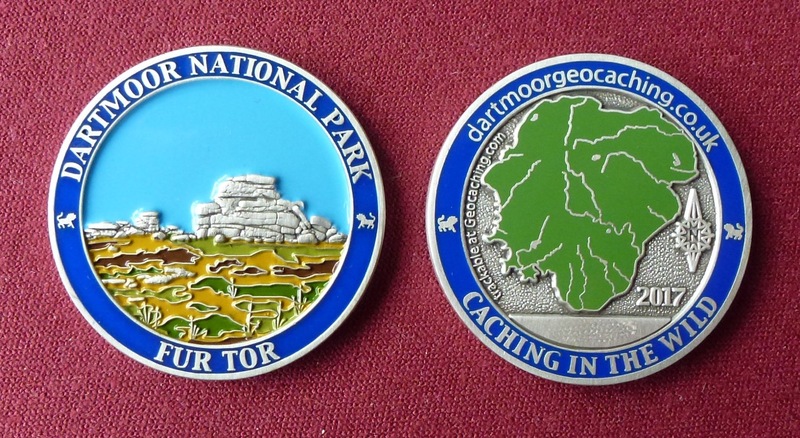 Many, many thanks to all who will be purchasing the 2019 Dartmoor Geocoin. Once again we have organised an extra activity to coincide with our 2018 New Year Cream Tea Event which is being held on 1st January, 2018 at The East Dart Hotel, Postbridge. This year I have been forced to simplify the challenge as we were away prior to Christmas and I knew that there would not be time for placing the usual number of caches and getting them submitted for a timed publication. However, this does not mean that the challenge will be less demanding and will probably take about the same time as previous years. 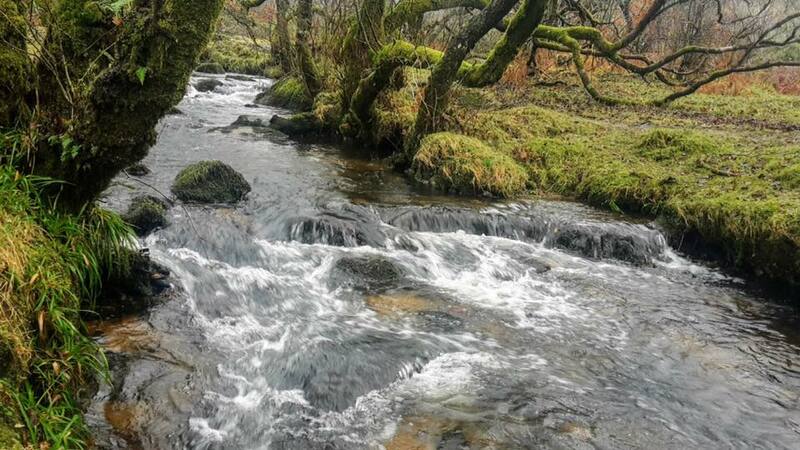 At about 8:30am on 1st January 5 new caches will be published on Dartmoor. and 4 new geocoins will be released. The geocoins have already been placed and their locations will also be made available at about 8:30am. In order to discover the locations of the geocoins you will need to place them on your watchlist. 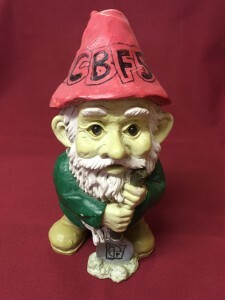 As in previous years I will again be using opencaching for some of the caches, although the bonus cache will be published on geocaching.com – although possibly not on 1st January, due to new restrictions being imposed! All caches can be found without needing to be registered on opencaching, but please DO register and LOG your finds on that listing site. Some of you may ask – why use opencaching? There are several reasons. For me the most important reason is that opencaching encourages quality caches in great locations and GC can always be used for c&d micros! Unfortunately almost all of the best locations already have a GC cache and the proximity rules virtually prevent more than one cache per tor – which is crazy as there could be a dozen letterboxes on that same tor. Opencaching also encourages innovation with moving caches, virtual caches and webcam caches all still being allowed. Publication is also much easier as the CO can decide when a cache should be published and there are fewer hoops to jump through! 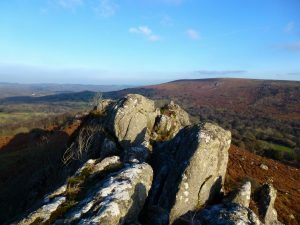 I have placed an unactivated 2016 Dartmoor Geocoin keyring in the cache for FTF. There were only a very few of these made. However, I am very happy to swap it for a normal geocoin. The Important Stuff is Here! The 5 caches have now been placed and the four 2018 Dartmoor Geocoins have all been activated and in position for New Year’s Day. 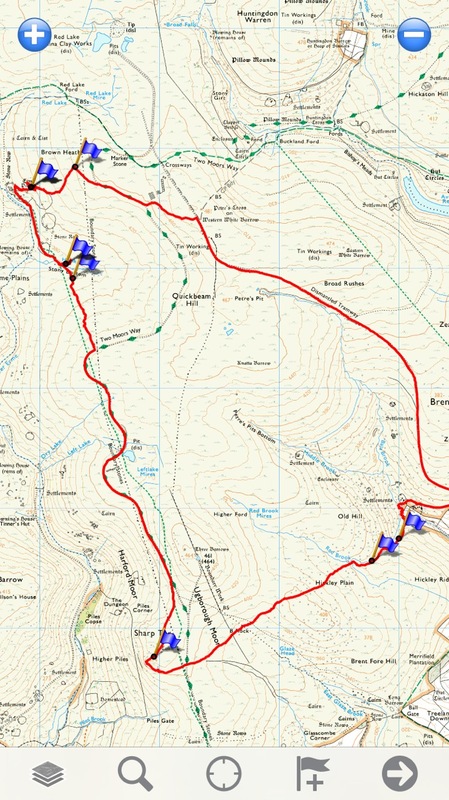 The total STRAIGHT LINE distance from nearest parking to every cache, and back, is less than 7 miles – so slightly longer than last year, but easy routes as no stepping stones. Two of the caches are in the Haytor/Hound Tor area (and could be combined into one walk), one is near the road from Dousland to Princetown and the other is within walking distance of The Cherrybrook. All caches will be published at or before 8.30am on New Year’s Day. The locations of the 4 Dartmoor Geocoins will also be announced at the same time, so please do add these to your watchlist now. One cache is located within walking distance of The Cherrybrook. 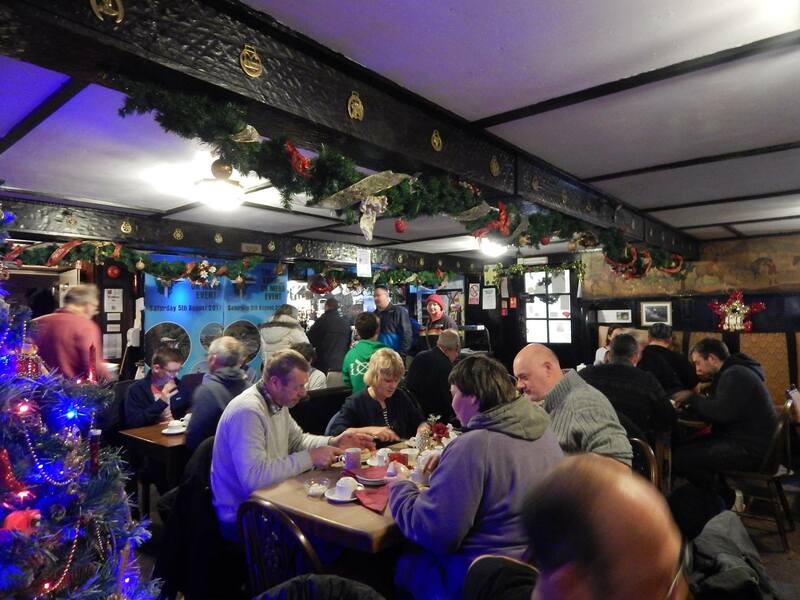 You may come to The Cherrybrook AFTER 8.00am if you wish to use our wifi or to park in our car park – you may even get a cup of coffee or slice of toast! IMPORTANT: When you register you should IMMEDIATELY get an email. If you can’t see it check your junk and spam folders. If you can’t find it them please contact me (Dave Martin) as soon as possible. Please note that you can participate in this activity without attending our New Year Cream Tea event and can attend the event without participating in this activity. A beautiful January day was forecast and so much on the “to do” list. Much of it centred around the wonderful Widecombe area. 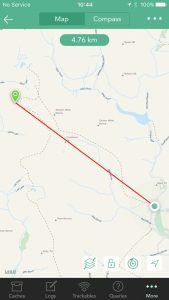 A few caches of mine needed to be checked, a difficult multi to continue, but the main objective was my first attempt at a Whereigo – A Moment in Time. But whilst in the middle of planning, 2 new caches suddenly appeared! 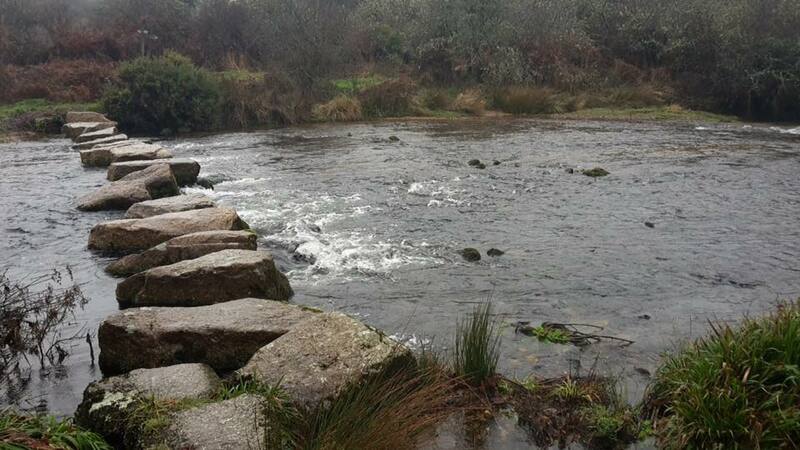 Another multi in Widecombe and a difficult 4.5/3.5 multi just up the road from there. So, some rapid re-planning was needed. 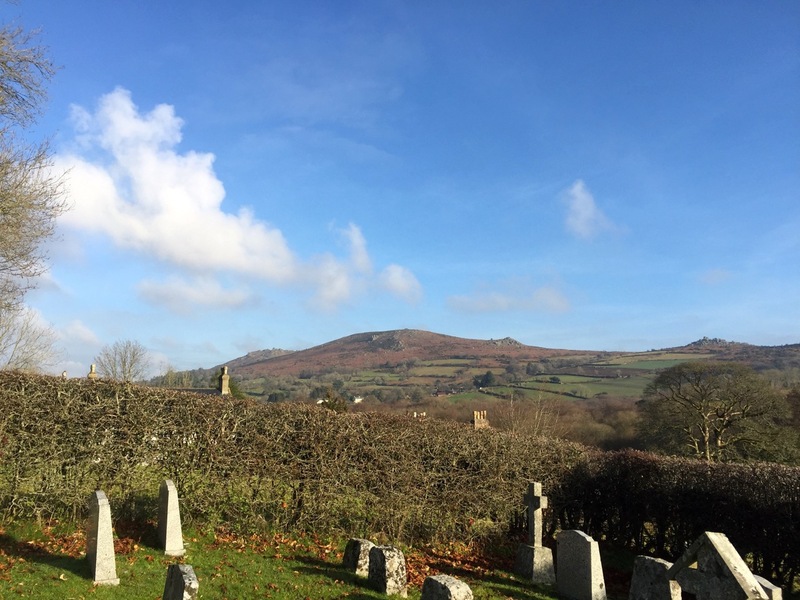 The day was indeed a beautiful one and the first stop was the church micro at Widecombe. I soon rushed around the necessary gravestones and the CO kindly organised that the last waypoint was a seat where you could sit and calculate the final. However, when I got there I think the tree had gone! I can’t be sure so have sent photos to the CO, but there was a freshly sawn stump right where I made GZ and the tree stacked up outside. So I started with a DNF! 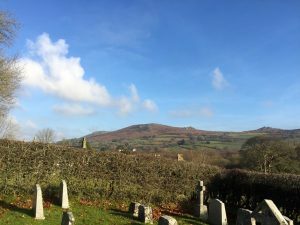 Right outside the churchyard was the new Widecombe multi and that was soon calculated and the cache found in a lovely spot I hadn’t visited before. Next on the “to do” list was a difficult Cash in Cache multi which I had started on my previous visit to the area. These caches all appear to be micros and so far, I believe all have actually contained cash! I have in my possession half a £10 note I found in an earlier cache which needs to be matched with the other half, held by two other cachers! There are 3 stages to this multi and I made my way straight to stage 2 having found stage 1 last time. Eventually after a long finger tip search I found it, but no luck at the 3rd stage, which has probably not been found (1 found log, but which looks unlikely). So 1 find and 2 DNFs for me! Next up was some checking and maintenance on my nearby series. 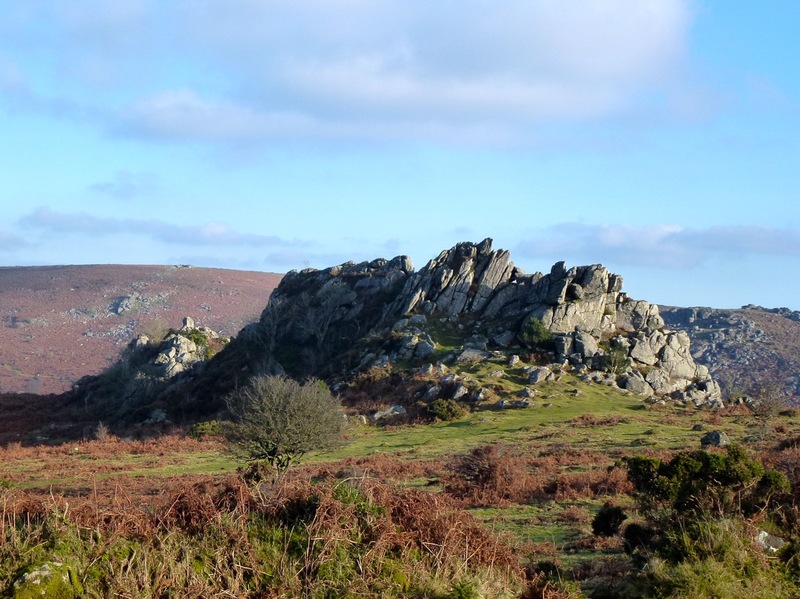 This series is placed along a delightful row of 3 impressive tors but I hadn’t checked them for some time. There had been 3 DNFs on Honeybag Tor but I eventually located the cache. 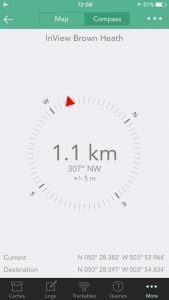 I’m not certain if it had been moved or not, but I moved it closer to the coordinates which seemed to be about 5 to 6 metres out. 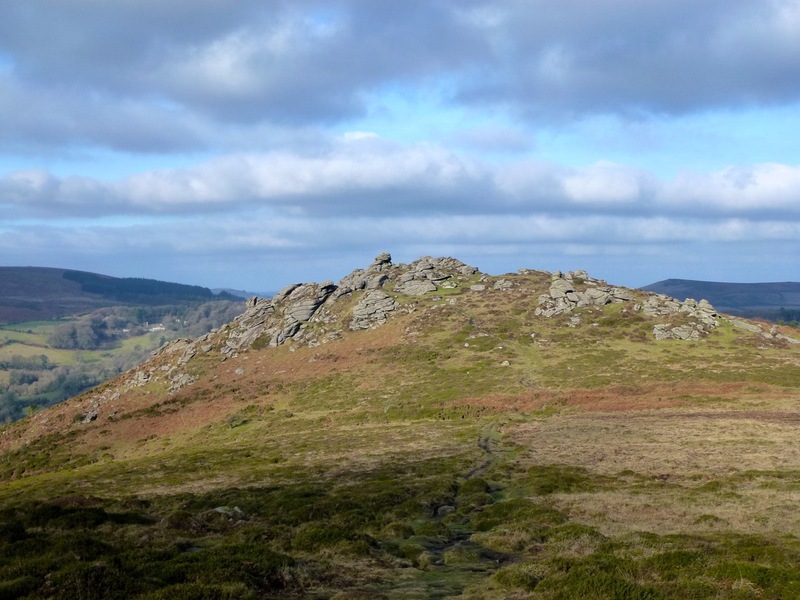 I easily remembered where the Chinkwell Tor cache was, so then moved down to Bell Tor. 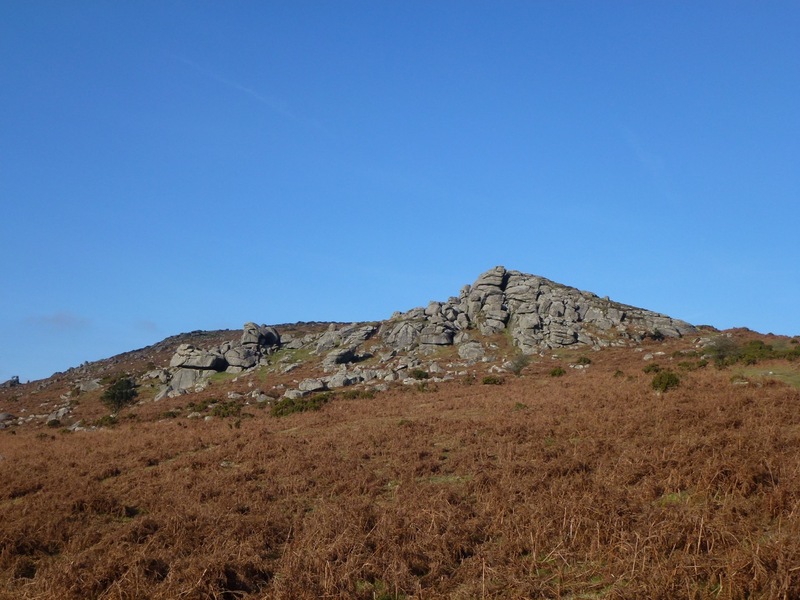 Bell Tor was a problem as the previous finders found it damaged a long way away and kindly moved it back to the coordinates. But of course I had no idea where they had placed it! A long unsuccessful search followed and I eventually sat down for some lunch. I placed my hand into a nearby hole and there was the cache! It had been totally trashed, with only half the bottom still there and a saturated logbook. Just why do people do this! I had come prepared with a replacement and had soon returned to the car. I was already much behind schedule so decided not to bother with the new 4.5/3.5 Cash in Cache multi – it would probably need a whole day anyway. So I drove to the A Moment in Time Whereigo. It looked to have loaded ok as it said I was “Inside Zone” in the car park. However, it gave me no instructions and never having done one before I had no idea what to expect. I walked for about 15 minutes following the red arrow, but it was still telling me I was in the car park! There was nothing more to be done with the Wherigo but there was a cache to be checked on Greator Rocks. Greator Rocks is a magnificent lump of granite and I have a Opencache there which has not been found since 2014. 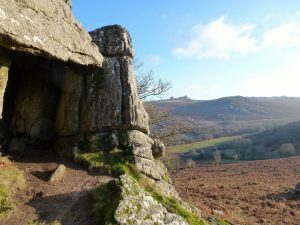 This cache is probably the best located cache I have on Dartmoor, it is in a wonderful position, but being an Opencache is rarely visited. It needs a fairly difficult climb up to the cache, but the views are wonderful. Fortunately I remembered where this cache was and it was soon in my hand – having only ever been found once. 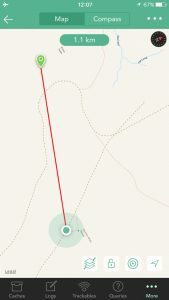 The GPS read 2m! As I was so close I then decided to check out a friend’s nearby cache which had received 4 consecutive DNFs. 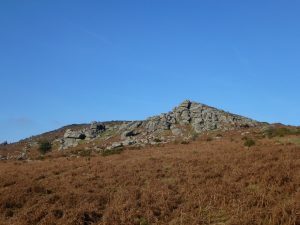 In fact it is almost certainly the cache that has more DNFs than any other cache on Dartmoor, with 131 DNFs but only 35 finds. However, it was soon in my hand and when I checked the logbook I discovered that the last 2 finds were false which meant in reality the cache had 11 consecutive DNFs going back to August. 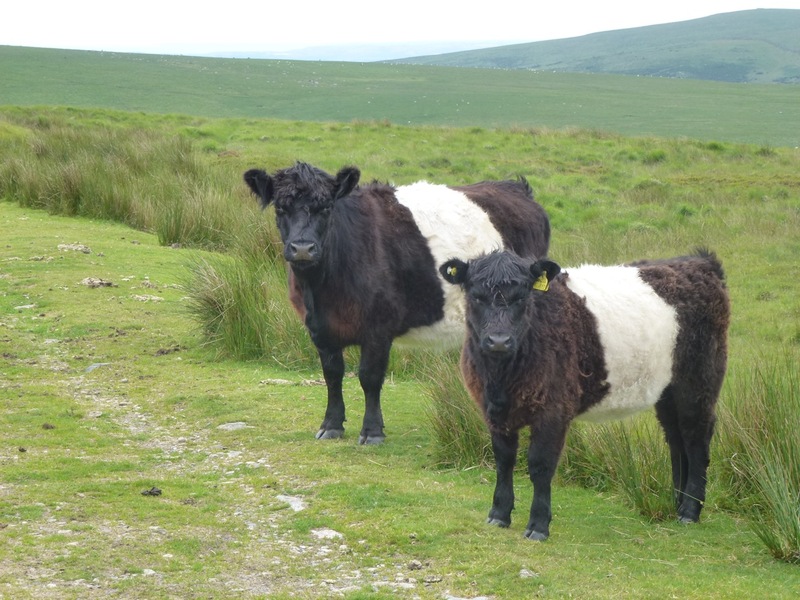 The last task on my “to do” list was to check on another of my Opencaches, the one on Rippon Tor. This has had a few DNFs and I couldn’t remember where it was supposed to be, although there was a hint. Eventually I caught sight of it up through the rocks and managed to retrieve it from above. On my way up to Rippon Tor I was surprised to see an earthcache which I didn’t know existed as it is hidden under other icons on the map. Hopefully I have gathered enough information to answer the questions, took some photos and this should be a nice bonus cache to end the day as the sun was rapidly setting. 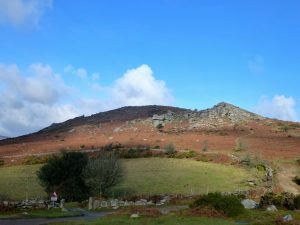 For those not familiar with Widecombe it is a beautiful area with a wide variety of caches close by. There are a couple of nearby series, my small series of fairly isolated caches, two very difficult multis – neither yet found, a couple of more traditional multis, plus some Opencaches for those who wish to try something different. Certainly something for everybody and an area well worth exploring. Once again we have organised an extra activity to coincide with our 2017 New Year Cream Tea Event which is being held on 1st January, 2017 at The East Dart Hotel, Postbridge. We seem to have run out of local tors to place caches so this year we are visiting rivers. But no swimming is necessary! At about 8:30am on 1st January 10 new caches will be published on Dartmoor. This year we have abandoned using offset caches and instead there will be 9 simple traditional caches and one very simple bonus cache. Unusually for me, all of the caches should be simple to find and each will have a good hint to help you. The challenge is to plan your way around the caches rather than to spend hours finding them. Almost every cache will have different approaches to it. Maybe a short route with a river crossing or a longer route without one. Yes, similar to last year, 3 of the 10 caches will have an unactivated geocoin as a FTF prize. I would ask that any caching group takes no more than 1 of these coins. Please do leave a second FTF geocoin to another group. 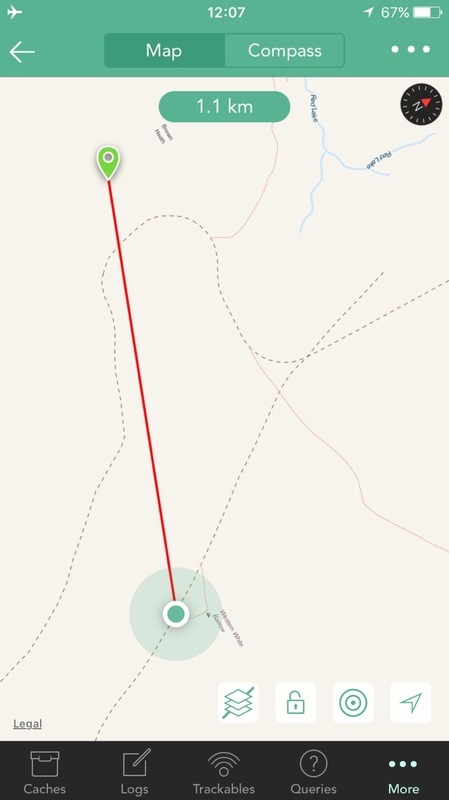 The total STRAIGHT LINE distance from nearest parking to every cache, and back, is less than 6 miles. 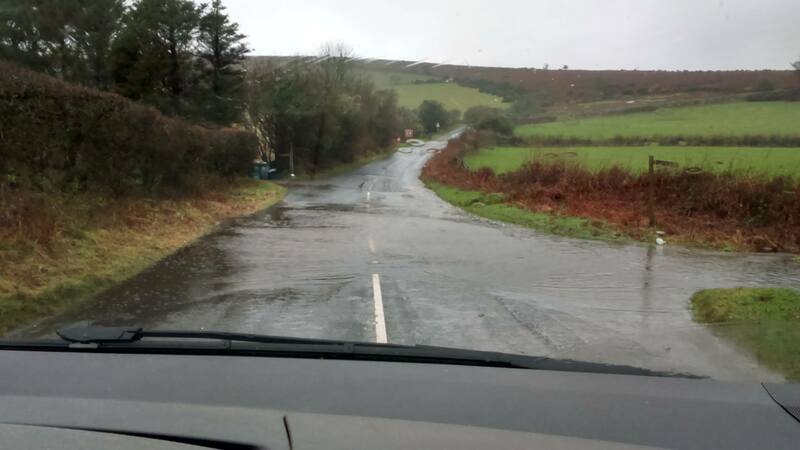 But you will need to plan your routes! Two caches are near the Swincombe. If you approach from Hexworthy or Holne you MUST NOT DRIVE PAST THE CATTLE GRID TO SHERBERTON, there is NO PARKING past that point. All caches will be published at or before 8.30am on New Year’s Day. You may come to The Cherrybrook AFTER 7.45am if you wish to use our wifi. 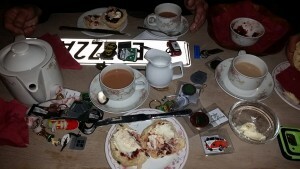 As in previous years some caches will be published on www.opencache.uk. You will need to register in order to see the cache coordinates. Please DO log your finds on opencache. 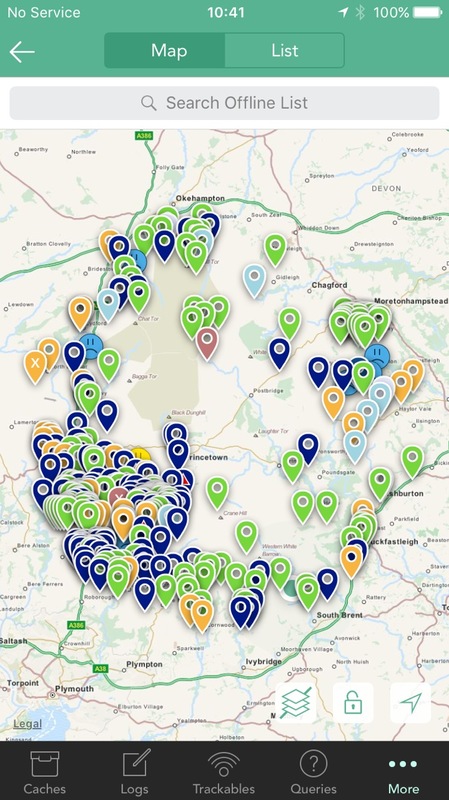 As in previous years, some of the caches will be listed on geocaching.com and some on opencache.uk. There is not a long list of rules, but please use ONLY ONE CAR for each group and do not swap bonus numbers with other groups. So, how many are up for our Five Rivers Challenge? Please reply to this post to let us know if you will be taking part or to ask any questions. Unfortunately, as I also mentioned, there has been a dramatic increase in cost this year as the production costs have gone up by 13% and this together with the huge difference in exchange rate has meant that the total cost has gone up by over 30%! However, the good news is that I will only increase the cost by £1, but if you buy two or more the price will be the same or less than last year. The costs for all coins (whichever year you want) will be £14 for the first coin but only £12 each for ALL additional coins. The cost for 1st class p&p will be £2 for 1 or 2 coins and £3 for 3 or more coins. 3 or more coins will be sent 1st class signed for. As in previous years, if you wish to purchase a second coin to be entered in the 2017 race I will offer a £4 discount, so it will cost £10, a total of £24 for both coins, plus £2 p&p. However, as promised, if you entered a coin in the 2016 race AND activated it AND released it, the race coin will be half price, so only £7, a total of £21 for both coins, plus £2 p&p. 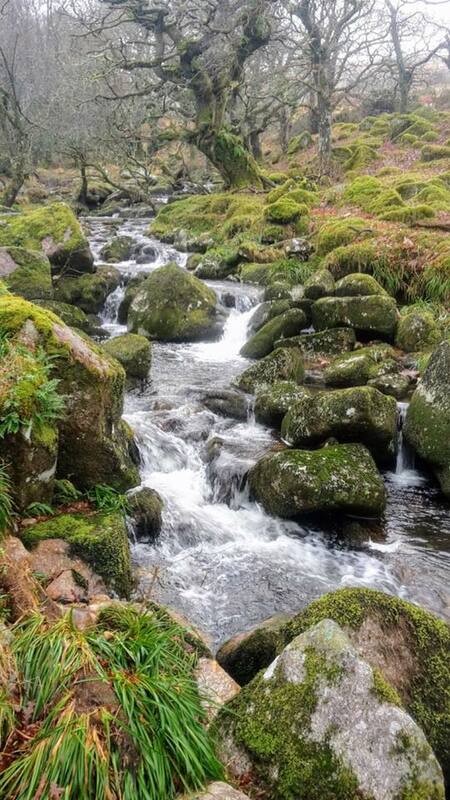 Caching with Cachly on Dartmoor with an iPhone! 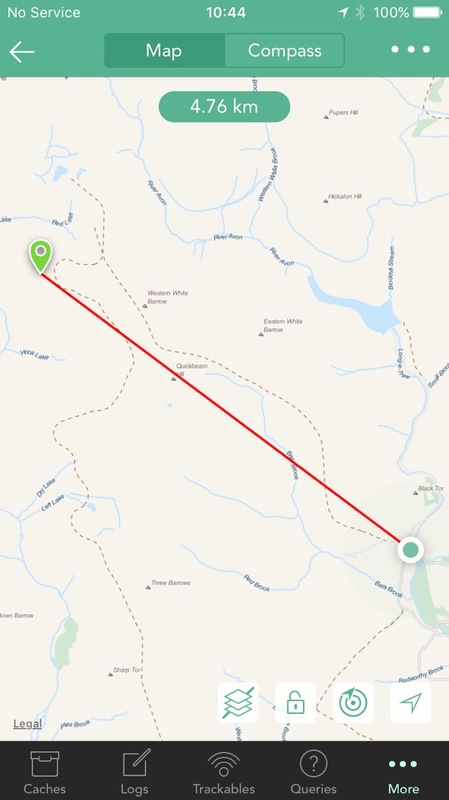 This isn’t a formal review of Cachly, but an example of a day’s caching on a remote part of Dartmoor with an iPhone but no phone signal. Click on a photo to enlarge it. I’ve been beta testing Cachly for some months now and have been amazed at the functionality available and the frequency of releases from the developer. My main interest though is to see how it performs when there is no phone signal, so all my testing has been done offline. To start you need to create an offline list of the caches you are interested in and this is a very easy process. 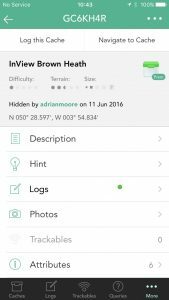 The caches are either based around your current location or another location and they download in batches of 50 caches, with a large selection of search criteria. You obviously need wifi or a phone signal to download them! Once downloaded they can then be saved for offline use and you can save photos and/or maps with them and you get a warning of how much space this will take. The caches I downloaded were my nearest 300 unfound caches. Interesting to see that my DNFs are shown with a blue sad face. I then drove to the point shown towards the south-east of the map from where I started my walk. The planned length of my walk was about 9 miles and I knew it would take the majority of the day. 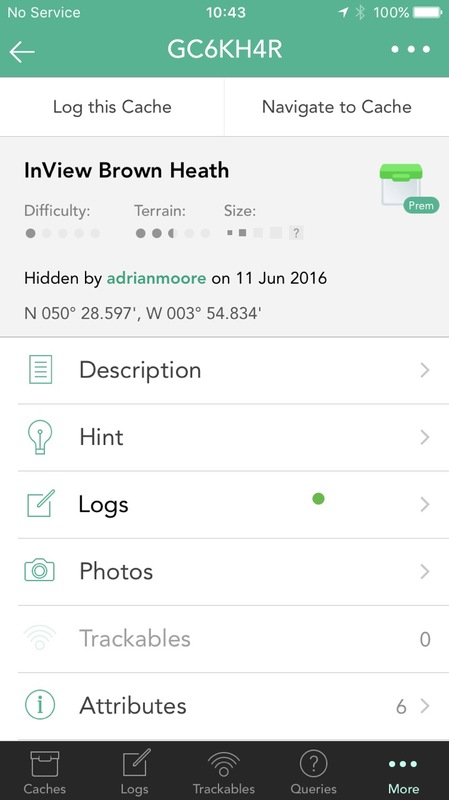 The first cache was InView Brown Heath and the single green spot next to Logs means that only the publish log exists – so maybe a FTF Tapping Navigate to Cache displays the map of the cache and the distance to it, in this case nearly 5km. The offline maps displayed are excellent and even at this scale show the main tracks, rivers and lakes etc. It was a great day for walking but I was well aware that I had at least 6 hours walking and the iPhone battery would never last that long. So I carry an Anker charger but knew that it wouldn’t be needed until I stopped for lunch. I’m not certain if I am right, but I am of the opinion that the battery will last longer if the phone is in airplane mode, especially if the phone signal is very intermittent, so I always select that. 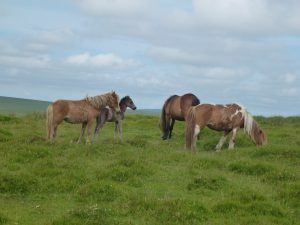 This is Dartmoor so it was not surprising to see some Dartmoor ponies, but I didn’t immediately spot the little foal hidden behind its mother. As I got nearer my goal I zoomed the map in and it showed a greater level of detail including footpaths that hadn’t been visible on the smaller scale. 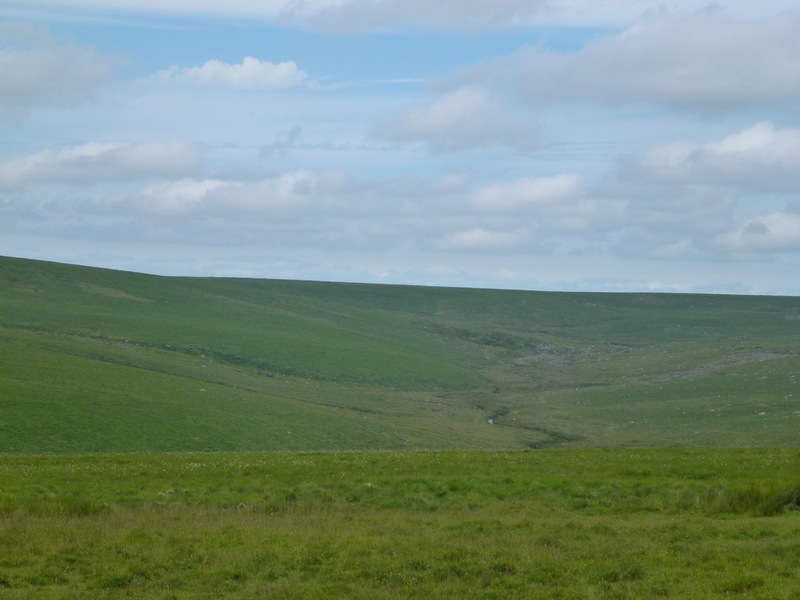 This certainly gives the level of detail required for caching in open and remote countryside such as Dartmoor. 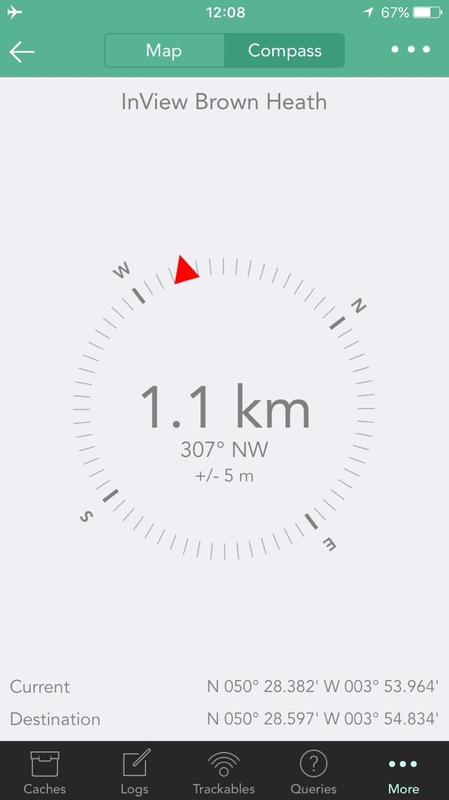 I also switched to the very well designed compass which seemed to work easily and took me straight to the cache. One criticism is that the map showing the cache you are navigating to, gives neither the name nor code of the cache. On arrival at the cache I was very pleased, and relieved, to see that I was indeed FTF. Had I had a phone signal I could have logged a find then and there, but without one I could either write a log to be sent later or write a cache note, which I can then refer to later. This is a lovely spot on Dartmoor’s south moor, although many would find it rather featureless without any stunning views. By the time I had finished my walk I had completed 10.2 miles taking just over 6 hours. I had one further FTF, another find and I placed two new caches. Apart from placing the caches, I only used the iPhone throughout the whole day. 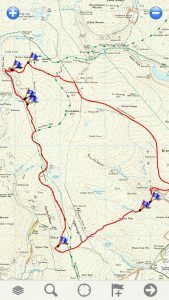 I carried a Garmin GPS which was only switched on to check the iPhone coordinates when placing the caches, map and compass, which I never looked at, and a satellite tracker in case I had a problem. My iPhone was also running Memory-Map to keep a record of my track. It is very clear to me that the combination of iPhone, Cachly and an Anker charger, is all you need for the most remote and difficult walks, although map and compass backup is essential. 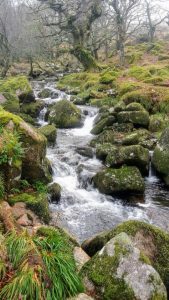 Author Dartmoor DavePosted on June 26, 2016 December 21, 2016 Format AsideLeave a comment on Caching with Cachly on Dartmoor with an iPhone! Once again I am pleased to say that there is demand for another Dartmoor Geocoin Race and you all seem keen to start it earlier this year. Many of you have already got your coins so as Easter is fast approaching I suggest we kick it off this weekend! The same as last year, I am only going to count the number of miles travelled. Please do not give coins to friends to take somewhere. All coins must be released into a cache to be picked up by anybody, not somebody known to you. Only original Dartmoor 2016 coins can be used – no nasty proxies please! Coins must start the race with zero mileage – if any mileage has already been recorded please delete those logs. If you buy a second coin from me at a cheaper rate it MUST be entered in the race. A couple last year never got started which is not fair on others who paid the normal price for their coins. 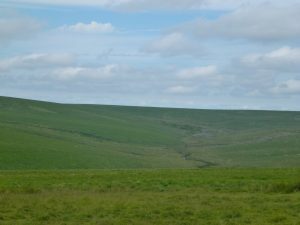 Once again I will award 2017 Dartmoor Geocoins for the coins with the top 3 mileages. You can get a really good start by placing your geocoin in a travel bug hotel. However, these could be more at risk than a normal cache. You also may want to avoid a cache & dash or place it in a PM only cache. However, after it has been retrieved you will have no control. Take time to explain on the trackable page all about the race that it is in. Also include a photo of the geocoin (you can use my one if you wish). Also attach something to the coin itself explaining exactly what is expected of the finder. We have so many new cachers and many will not know what they should do when they find it. Constantly track your coin and ensure that it is immediately logged when it is retrieved. Send emails to chase this up if it doesn’t happen quickly. Don’t let cachers forget they have it! The geocoin will remain your property and you can set whatever goals you would like on the geocoin page. I would ask you NOT to remove the geocoin’s name but to add to it, e.g. 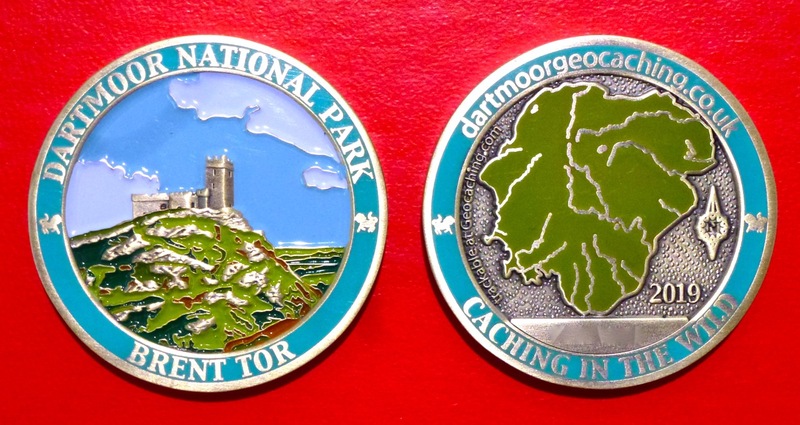 it comes named as Dartmoor National Park 2016 Geocoin, so you could add Sue’s ….. to the front of it. That way everybody can still search for it and I can produce some race details. If you haven’t already got a coin for the race please contact me by email at davidgmartin@me.com or add a comment below. If you have already bought one 2016 Dartmoor Geocoin I can supply a second one for only £9, but it must be entered in the race. This little chap turned up at our event on New Year’s Day and Judy is convinced it reminds her of someone! But what a day! For the third consecutive year we must have upset the weather gods for yet again it rained almost continually for the whole day. 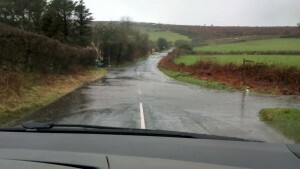 The photo right was taken by Graham as once again he negotiated flooded roads to get to us. Amazingly almost every single person who said they would attend did so. 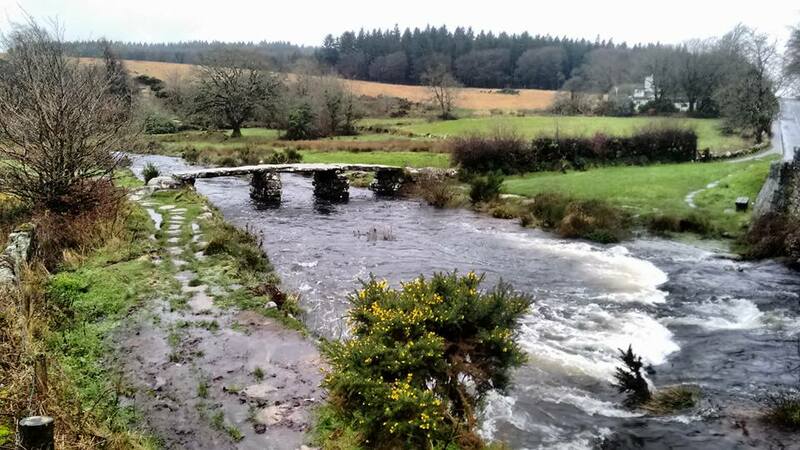 As would be expected in such conditions the rain caused our Dartmoor rivers to be in spate and this photo by Mike Norton shows the East Dart at the famous Clapper Bridge, a couple of hundred yards from the hotel where we were holding the event. From the 42 Will Attend logs we thought we may get about 80 people, but it would appear that we probably had over 90 (including our helpers)! What an amazing turnout. So, many, many thanks to everybody who braved the Dartmoor weather to get to Postbridge. Last year we struggled to serve 60 cream teas, but fortunately we had extra help this year and did manage to serve about 80 cream teas. However, the most amazing aspect of the day was the unbelievable generosity of all those who attended. As you know I had set targets of raising £350 for the Devon Air Ambulance and £100 for the 2017 Devon Mega Event. Well, we blew them out of the water! Last year we raised a total of £337 – this year it was £553!! The cream teas raised £233 and thanks once again to Caroline for selling the tickets, to all those who brought such a wonderful display of prizes and to everybody for buying the tickets – the raffle raised £225! However, we were not finished. We then moved into Auction mode and after three preliminary auctions which raised £25, the highlight of the afternoon was a Blind Auction for an unknown box of caching goodies donated by our very kind and popular reviewer, Heather. We had agreed a reserve which I thought we may struggle to reach, but after starting it at £10 I was amazed to see it go up in £5 bids. I thought it had been sold at £50, but no, Andy had bid £55, but he was beaten by Bob who was clearly determined to win it for his wife Corinna. I had already announced that all proceeds from the raffle would go to the DAAT together with two thirds of the cream tea money. 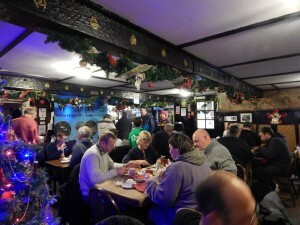 The auctions were split according to the wishes of those donating the prizes and there was another donation of £10. The result is that the Devon Air Ambulance will receive £430 and the 2017 Devon Mega £123. My last task is once again to thank everybody. Thanks for coming, thanks for being so generous in bringing raffle prizes, buying tickets and bidding in the auctions, thanks to my partner Judy, my sister Pat and her friend Ruth, to Sue (behind the bar) and her husband Mike (who did all the washing up) and to the Paul and Rosie landlords of the East Dart Hotel for allowing us to use the hotel whilst they were away on holiday – totally free of charge. In fact, once again there were no deductions and every penny taken (except over the bar) is included in those total amounts to be donated.